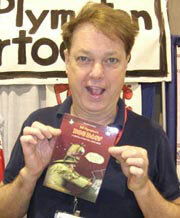 Bill Plympton is the hardest working animator in the world today. No disrespect to any other hard-working animators out there, but it’s absolutely true about Plympton. He’s constantly working on several working short films and features at the same time. Plus, he flies all over the world to film festivals and events to promote his work, which you can read all about on the new blog Scribble Junkies that Plympton produces with his friend Patrick Smith. And now Bill Plympton has taken on the monumental task of self-distributing his latest feature film Idiots & Angels, which is about a selfish man who magically grows wings one day that instantly make him a target for other people’s selfish desires to abuse his gift for their own gain. After a successful festival run, Idiots & Angels will finally make its theatrical premiere at the IFC Center in NYC on Oct. 6. Then, the film will open out in Los Angeles at the Laemmle Sunset 5 on Oct. 29. Plympton will appear at both openings with each one promising to be a screening event blowout of epic proportions. This is Plympton’s fifth feature film. (He’s also created a new short film this year, The Cow Who Wanted to be a Hamburger.) He’s been in the animation business for over 25 years, has been feted all over the world at numerous film festivals and his previous feature films have been distributed by different companies. He’s also been nominated for an Oscar twice, won awards at the Cannes Film Festival and dozens of awards at other festivals. And his animation is one of the most distinct and recognizable styles in the field. Theatrical distribution is one of the biggest struggles any filmmaker has to face. And here’s a filmmaker with so much talent and success over such a long and distinguished career still dealing with the issue of just getting his film into theaters so it can be seen by as wide an audience as it deserves. So, I thought it’d be good for other filmmakers to hear about Plympton’s experiences. Luckily, he was able to take some time out of his busy schedule to answer a couple of questions, which are below. Underground Film Journal: You have both a new feature and a new short this year. How do you balance your time working between the two formats? Bill Plympton: It works very well for me. While I’m doing post-production on the feature film, I have 2 or 3 months to put together a short. So, it’s very doable. UFJ: You’ve had to resort to self-distribution for your new feature Idiots & Angels this year out of necessity. Who were the theatrical distributors of your previous features? Did you have good experiences with them? Plympton: The Tune (1992) was distributed by October Films and it was a big disappointment. I Married a Strange Person (1998) came out with Lions Gate Films and it did well at the box office and I ACTUALLY GOT A ROYALTY CHECK!!! Mutant Aliens (2003) was distributed by Carole Crowe of Apollo Cinema in a very limited release, so I got very little money. UFJ: What do you think has changed with film distribution over the years that you’ve now had to resort to self-distribution? Is it the distributors? Theaters? Audiences? Plympton: I believe the whole indie distribution economy is in a massive shift. In that past, it was theater, TV, and video. Now, it’s VOD, Netflix, Internet, and YouTube. So in many cases, a filmmaker may not need a theatrical release to make money. UFJ: Are you familiar with Nina Paley and the success she’s had releasing her first animated feature Sita Sings the Blues for free on the Internet, which then led to a theatrical run? What do you think of that form of distribution? Viable for everybody? A fluke for Paley? Plympton: Her film is wonderful. Very visual and beautiful and I congratulate her on her success. However, she failed to get the rights to the music for it, so it became a big fiasco. Her form of release would not work for me. I want to get an Oscar nomination so I need to release the film in cinemas first. UFJ: How many years have you been going to and promoting yourself at Comic-Con in San Diego? How hard is it to stand out amid the bombastic studio promotion that’s going on all around you? Since you’ve been more than once, I’m assuming it’s been a beneficial experience. Plympton: Yes, Comic-Con has been a fun experience, but with travel, hotel, and booth rental I don’t make a lot of money. However, I enjoy the atmosphere and revisiting cartoon and animation friends. UFJ: You’re also the subject of an upcoming documentary, Adventures in Plymptoons by Alexia Anastasio. How’s it been participating in that? Weird going under the microscope? Plympton: Alexia is editing the documentary together now. I’ve seen clips from it and it looks amazing. She’s asked me some very pointed questions and I try to answer them honestly. I don’t want to be part of a documentary that’s fawning. I want to show my fans the difficulty in being a truly independent animator. UFJ: You’re famous for being a “go it alone” kind of guy when it comes to making your films — and now distribution. However, I’ve long been fascinated by your collaboration with Kanye West on his music video “Heard ‘Em Say.” How did that come about? Do you and Kanye chill at Diddy’s house now? Plympton: Kanye called me up late one night and asked if I was the guy that did the short animated films. I said yes and then he asked if I would do his newest music video. But there were two catches: One, there was no money. Michel Gondry had spent a half a million dollars on a “Heard ‘Em Say” music video he didn’t like. Two, the film had to be finished in a week to meet the MTV TRL deadline. Of course I said yes. I knew he was a big star and it would get a lot of play. Finally, he did pay me a small fraction of what Mr. Gondry got and, sure enough, the film played everywhere. No, Kanye and I don’t hang out. But, I talk to him occasionally to catch up on new projects. UFJ: And, of course: What new films are you working on? Plympton: I’m working on a new dog short, Cop Dog. Hopefully, it will be finished in the Spring. Also, I’ve started 2 feature films. Cheatin — a much more stylized and romantic Idiots & Angels — and a Flash film about Tiffany the Whale who wants to be a high fashion model.